A smart city uses technology and data to make people’s lives better, easier, and safer. It’s really that simple. While innovation is incredibly important, making a city “smart” is not just about new inventions. Often the technology or data we use already exists. It just takes a fresh look to start using it in a new way that improves sustainability, reduces the city’s running costs or energy consumption, or makes life more productive and fun for residents and visitors. Smart Christchurch's vision is to promote Christchurch as an exemplar open and connected city, showcasing solutions that make life better and are replicated by others. Find out more about what we do, why we do it, and how we work. Anyone can suggest a Smart Cities project. We’ve had projects that have been initiated by businesses, local innovators, and community groups, as well as other teams within Council. Depending on the project, we may partner with you to make it reality, but if you just want to make a suggestion without being involved in development, that’s fine too. 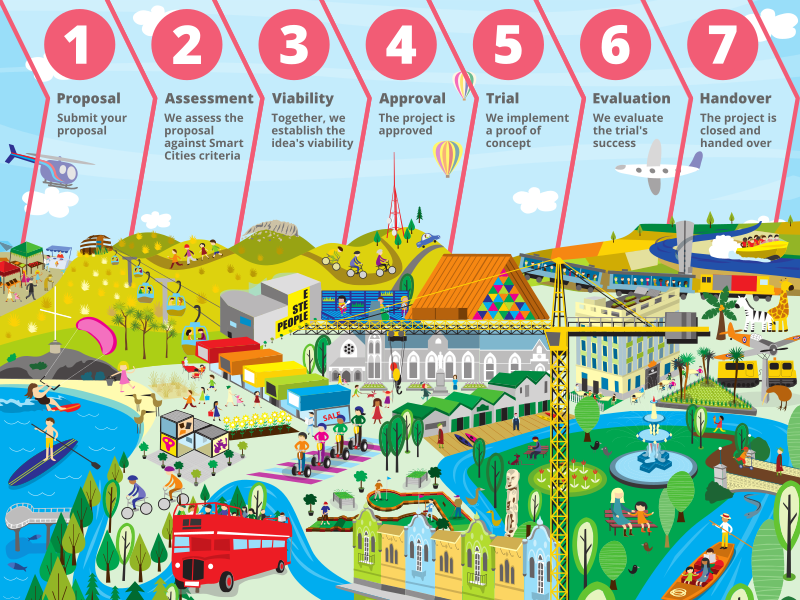 Please review how the Smart Cities Christchurch programme works and submit a proposal using our online form, or get in touch with us at smartchristchurch@ccc.govt.nz. When we receive a proposal, we evaluate it to see if it’s a suitable Smart Cities project. We score every potential project against the same criteria. This helps us to evaluate different projects in a consistent way, and ensure we choose only the projects that fit best with our mission. At the viability stage, we discuss with you how we will approach this initiative. We’ll identify what’s required, who we need to collaborate with to get data, funding, or resources, and how long the project will take. Timelines for innovative projects can be hard to pin down, especially when we’re relying on third parties, so we usually work to major milestones rather than detailed time frames. Once we have completed our assessment and confirmed the proposal’s viability, we will recommend it for approval. Whenever possible, we use quick trials, small pilot projects, or beta releases to test out new ideas. We’d rather “fail fast” with an imperfect prototype than spend years trying to plan and then create a perfect solution. A pilot project tells us what works, and where we can improve. Based on initial results, we may expand the pilot to more users or locations, or make small changes and run another round of trials. At the end of the pilot, we review the results, and decide whether we can declare the pilot a success. If it’s clear that an idea can’t be made viable, or isn’t right for Christchurch right now, we’ll end the project. We try to learn as much as we can from the unsuccessful pilots, and openly share our lessons with others so that the same mistakes won’t be repeated. The Smart Cities team is in charge of trying new things, not day-to-day running. Once a proof of concept is successful, and is mature enough to thrive beyond our programme, we’ll hand the project over: either to our partners to continue to develop, or to another team within Council. The new project owners will be responsible for integrating the innovation into their existing operations, rolling out any new technology, and maintaining the systems. When we assess a new proposal, we look at all the usual factors like cost, feasibility, and time frames. But at Smart Cities, we’re after something more. First, our projects all revolve around technology and data. If you’ve got a great idea for a new annual event, or you know about a new type of playground equipment that children would love to use in our parks, another Council team might be interested, but it’s not for us. Second, we’re looking for innovation. The idea doesn’t have to be brand new, but it has to be new to us. Maybe it’s a great product we haven’t seen in Christchurch, or New Zealand, before. Perhaps it uses an existing solution in a new context, or puts two familiar technologies together to make both better. Or the data was already there, but your project makes it more accessible, more engaging, or easier to understand. What we’re looking for above all is innovation that benefits people. We need to be able to identify clear benefits for people in Christchurch. The benefits may be intangible, like improving people’s enjoyment of the city, or their feeling of wellbeing. Do you have an idea, a product, or a solution that you think we’d be interested in? Submit your proposal now!